Are you a serious adventure seeker wishing to explore overhead environments? Sign up for the TDI Cavern Diver course! 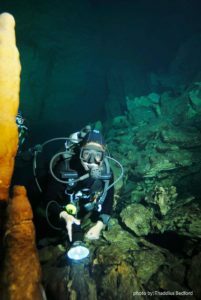 This course is designed to develop the minimum skills and knowledge for cavern and overhead environment diving within the limits of light penetration, and outline specific hazards associated with cave diving. The cavern diver course is not intended to provide instruction for cave diving environments. The objective of this course is to train divers in the proper planning, procedures, techniques and hazards of cavern diving.